While traveling through Myanmar, I was struck repeatedly not only by the intricate beauty of its temples, but by the deep and profound spirituality of the people. The Buddhist faith seems to permeate every aspect of life in Myanmar. In all of my travels, I couldn’t think of another place where religion was so deeply ingrained in its people. Staged photo, panorama from 4 vertical shots, focal length 14 mm, aperture f/8, shutter speed 1/10, ISO 1600, tripod, 2 led lights. I was particularly impressed Myanmar’s children, many of whom were novice monks. They were barely old enough to read, and already they had dedicated themselves to a life of study, prayer, and meditation. I saw them inside virtually every temple, heads bent in concentration. The exact dates of the Buddha’s life and death are unknown, as are other crucial details of his life. But that’s no matter. It is the essence rather than the facts of his life that is significant. And I could see it — that devotion to edification, the pursuit of something beyond oneself — reflected in the faces of the young novice monks I encountered. It was one of the most profound experiences of my life. 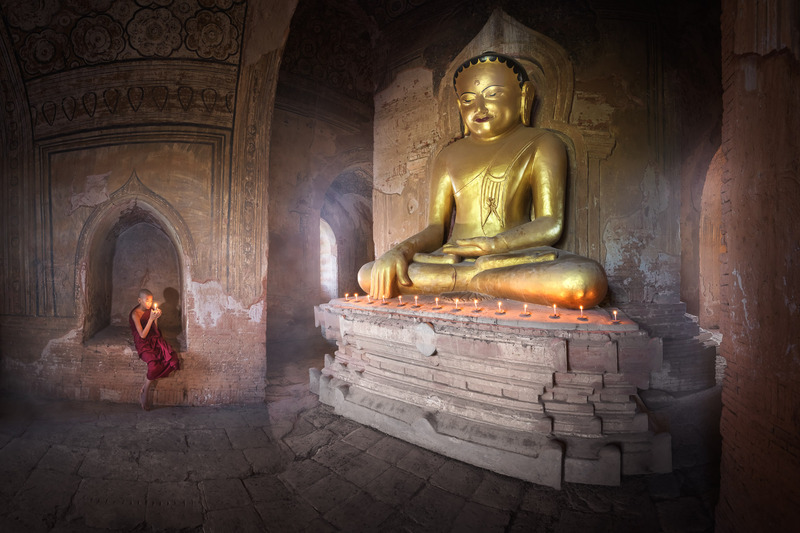 This entry was posted in Interior and tagged Bagan, Myanmar.